BIRMINGHAM, Ala. (BP) — Has playing the organ become a dying art? What has happened to the organists — the ones who read three staffs of music, dance on the pedals, maneuver multiple manuals, pull organ stops, push pistons, manipulate swell and crescendo pedals and follow a director — all at the same time? Is there no one else to sit on the bench where “Aunt Sally” sat for 40 years? PixabaySamford has had only one incoming freshman majoring in organ each of the past two years. Some piano majors are choosing to complement their degrees with organ in order to diversify their abilities and experiences. “All musicians, not just organists, must possess broad skills to have a viable career in music,” Mathis said. Even Jubal, the biblical father of music, diversified by playing more than one instrument: “And his brother’s name was Jubal: he was the father of all such as handle the harp and organ” (Genesis 4:21). Educational requirements are demanding for organ majors. Samford offers an organ performance degree as well as a degree in music and worship or music education with an emphasis in organ. Other Alabama universities, including the University of Alabama, Birmingham Southern and the University of Montevallo, offer similar degrees. But not all organists have degrees in music. Approximately half of the Birmingham American Guild of Organists (AGO) chapter members, including supporters, do not have music degrees. Schools with nationally reputable organ programs such as Baylor University in Waco, Texas, and Mercer University in Macon, Ga., have seen increases in the number of organ majors. Other, lesser-known university organ music programs have dropped their programs altogether. Dan Lawhon, dean of the Birmingham AGO, admitted we could be “shooting ourselves in the foot” by not having universities give priority to keeping up a high organ profile. With fewer trained students, the gap to replace organists is widening. Rural churches have even wider gaps. “Aunt Sally,” who is retiring at 70, 80 and even 90 years of age after decades of service, has no one to replace her from the younger generations. Most organists in the Birmingham AGO are more than 40 years old, said Lawhon, noting he has detected more difficulty in filling organist vacancies in the past 10 years. Keith Hibbs, director of the office of worship leadership and church music for the Alabama Baptist State Board of Missions, has experienced the consequences. It has been seven years since the organ in his home church, Dalraida Baptist Church, Montgomery, has been played. Church leaders finally gave up after trying to find an organist and removed the organ when the church was renovated. To accommodate for organ vacancies, some pianists switch to organ but a pianist is not the same as an organist. The music may be the same but the skills, sounds and techniques are not. For example, the common practice of sustaining is achieved by an organist’s fingers and feet while the piano has a sustain pedal that is pressed. This is corroborated by Hibbs who agreed there has been an ongoing pianist shortage for 25 years. Why? One reason is the level of commitment. Another is the cost for years of lessons, in addition to tuition and private lessons for those seeking degrees. Then there is the cost for the instrument itself as well as its maintenance. The guitar has become the instrument of this generation. It’s easier to play, faster to learn, requires less commitment and is significantly less expensive to purchase and maintain. Another strong advantage of the guitar is that it is considerably easier to find a replacement guitarist. Opportunities for organists are diminishing in direct proportion to the prevalence of the traditional service, said Russell Williams, pianist and organist at First United Methodist Church, Trussville. Organist positions are typically part-time positions with a wide salary range depending on church size and expectations as well as the organist’s experience and education. 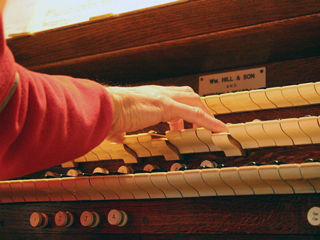 Many churches are choosing to combine the organist position with another role. It is rare to find a full-time organist position at any church of any denomination. And not every organist is a good fit for every church. Churches have different needs so they must find the right fit in their organist to meet those needs. What is the response to this widening gap of organist vacancies? The AGO encourages mentoring of students within the church and community. Every year the AGO hosts a Pipe Organ Encounter Advanced Workshop for auditioning high school students across the U.S. The AGO routinely hosts other non-auditioned events to instill greater organ interest. Samford also added a new scholarship fund provided from a donor specifically for organ students who have significant interest in the role of the organ in congregational song. “Church music is in a constant state of change, and with the addition of praise and worship, the worship life of the congregation has changed…. Many churches have built new sanctuaries, installed multimillion dollar organs and hired organists, while other congregations across our state have built multipurpose buildings that don’t have organs because they cannot attract and/or afford organists. Both have followed their callings from God,” Mathis said.